One of these days, students from Weber State University’s musical theatre program may fail to impress the hell out of me. Dark Horse Theatre Company’s production of The Great American Trailer Park Musical in Park City demonstrates that such a day has not yet come. 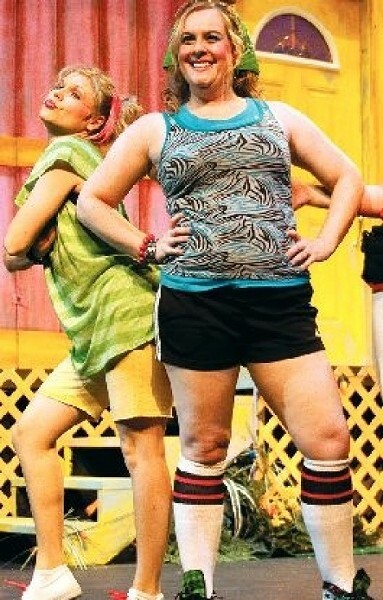 The show is a brisk, bawdy (beware of falling F-bombs) one-act set in the not particularly picturesque environs of Armadillo Acres, a trailer park in Stark, Fla. A Greek chorus/trio of residents—landlady Betty (Shalee Schmidt), tart-tongued Linoleum (Marianna Armitstead, pictured above right) and possibly hysterically pregnant Pickles (Carianne Hoyland Jones, pictured)—recounts the romantic travails of Jeannie (Lisa Grow) and Norbert (Rocky Revels) on the eve of their 20th wedding anniversary. Jeannie has refused to leave their trailer since the kidnapping of their infant son, and Norbert has begun to look for comfort with a stripper named Pippi (Jennifer Perry) who has just moved in next door. The story by Betsy Kelso is a broad lark, but several of the songs by David Nehls are genuinely catchy, including the bouncy “One Step Closer” and the brand-name-filled lament “Flushed Down the Pipes.” The real charm, though, comes from the cast members, particularly the WSU youngsters. Jones is a belter with solid comic timing, Perry delivers the saucy sexiness, and Sam Cook has wild fun as Pippi’s jealous, Magic Marker-sniffing boyfriend. Throw in Armitstead’s priceless tell-it-like-it-is moments, and you’ve got a group who knows how to sell the effervescence of musical theater. That pipeline from Ogden is in no danger of drying up.